Buying a globe can be a huge task. If you’ve finally made the decision to buy a world globe of your own, whether for personal use or as a gift perhaps, then we’d like to congratulate you. A world globe is a great addition to any home or office, serving as both a beautiful decorative piece and a useful, if not whimsical reference tool in today’s digital age. However, you should know that buying a world globe entails more than just going to a bookstore or mall. No, with the sheer variety of globe sizes, themes, materials, colors and more, you’re going to have your work cut out for you. Here are some factors to consider when picking out a world globe. 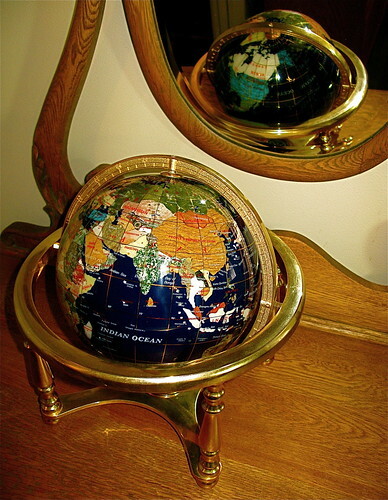 Besides serving as educational and learning tools, world globes also excel as decorative and entertainment pieces. As such, you’ll need to determine what you want with your globe before buying one. Do you want a globe purely as a reference tool, perhaps to help you teach your kids about the world? On the other hand, do you want a globe that will serve as a focal point in the room it’s placed in? Not all globes are the same, with certain spheres coming with features that make them unique from each other. Educational or learning globes for example, are best suited for teaching learners the fundamentals of geography and cartography. However, educational globes can have many differences between them, with many globes focused on political boundaries and others major historical events like discoveries and ocean crossings. And then there are globes that have a clear aesthetic appeal to them. These globes are not only great reference tools, but also exude the beauty and elegance that make them perfect decorative items. These globes include gemstone globes, which are made from semi precious stones, illuminated globes, which have a light inside the orb that illuminates it from the inside out, and even old world style globes, which have an antique-like finish. Should you prefer to buy globes with a decorative slant to them, just remember that these orbs are often more expensive than educational globes due to the materials they use, which can range from precious to semi precious stones, wood, and even silver and gold. Be sure to check back on this blog for Part II of this article series.